Loyalty has been at the heart of the Dearborne family for as long as Kate can remember, but a war is brewing in their small village, one that has the power to rip families asunder — including her own. As misguided actions are brought to light, she learns how deep her father’s pride and bitterness run, and she begins to wonder if her loyalty is well-placed. Review: This was a wonderful Regency era novel. 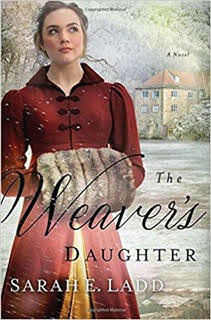 Kate is "The Weaver's Daughter" Henry is the grandson of the mill owner. They are a sort of Romeo and Juliet kind of couple, with both of their families feuding for many years. Both characters are very well developed and the secondary characters are just as important to the story, from Fredrica Pellington to Henry's sister, Mollie who is having a baby out of wedlock. I love that they are bringing real life issues to a Christian romance. Now I realize that a child out of wedlock may offend some "Christian" readers, but this is something that happens. Does it make a person bad? No, it does not. It means this character, like many people, have faults and flaws. Why shouldn't Christian fiction deal with things that happen in real life, and why shouldn't Mollie seek forgiveness, though other than the lies she told to protect herself, I didn't see her doing anything terrible. Both Henry and Kate showed great courage, standing up to people that wanted them to do things that went against their moral code, even if it was someone they cared for, or who was a lifelong friend. There's a dark underlying current to this story, with tensions running high between the workers and all of the mill owners. I was really surprised that Frederica didn't cause more problems than she did. The ending came as quite a surprise to me all the way around, from the uncovering of Henry's grandfather's killer to Kate's father. This was an absolutely amazing book especially if you are looking for something outside of the usual balls and stories about gowns.